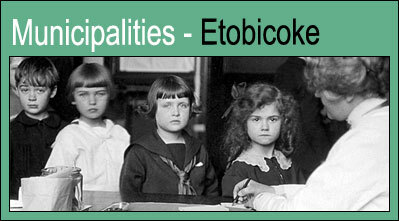 Many early records from Etobicoke have not survived, but we know that in 1945, the entire township was served by Medical Officer of Health Dr. W.K. Fenton, three public health nurses, and one part-time sanitary inspector. Dr. Fenton, a practising doctor well respected in the community, was instrumental in developing public health services in what he called “the great and growing Township of Etobicoke.” Etobicoke’s Public Heath Nursing Service was formed in 1946, with five full-time nurses to offer a generalized public health service serving mothers, infants, school children, and seniors. In the same year, the township also began to hire more sanitary inspectors. It had the distinction of being the first Canadian municipality to hire a female sanitary inspector, Margaret Conn, in 1950. As with other suburban municipalities, the post-war building boom affected Etobicoke significantly. Poorly functioning septic tanks on badly drained land became a recurring problem. When Hurricane Hazel hit in 1954, the flooding caused septic tanks to overflow, and contaminated water-filled wells, basements, and farmland. During the cleanup, the department had the huge task of inspecting flooded buildings, testing drinking water, and helping people disinfect their property. The department also opened 23 temporary typhoid immunization clinics to help control the waterborne disease.